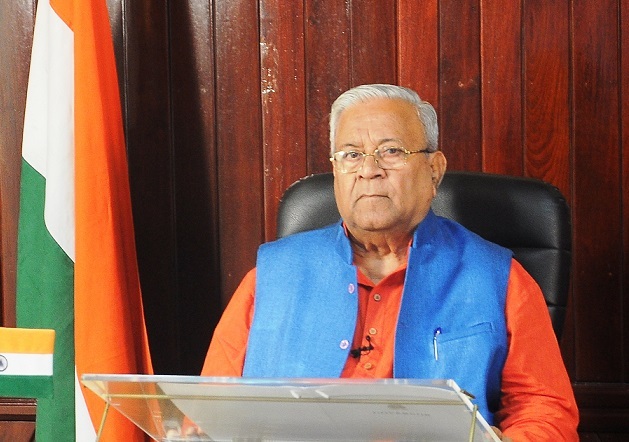 Nagaland governor PB Acharya has appealed to all sections of the Naga people, particularly the tribal hohos, civil society groups, NGOs, youth and hard working women folk and farmers to come forward and support the Naga peace process with a spirit of understanding, brotherhood and unity. Greeting the people of the state on the eve of 72nd Independence Day on Tuesday, Acharya hoped that the efforts of the people would scale new heights for overall development of the state, which, in turn, will contribute significantly to the progress and prosperity of the nation. The governor expressed pain that incessant rains wreaked havoc in the state over the past few weeks resulting in a lot of damage to roads and a large number of houses. He said the government machineries are making sincere efforts for restoring damaged infrastructure and providing relief and rehabilitation. Stating that chief minister Neiphiu Rio has appealed for help from the public for the flood relief fund, Acharya also appealed to all to contribute liberally for the victims of natural disaster. He said the central government is committed to raising the living standards of its citizens and ensuring inclusive growth for all. Acharya mentioned about the new role of Rajyapal which is vikas ke rajdoot (catalytic role of governors as agents for change in society). He said the recently concluded conference of governors in New Delhi discussed how the governors can be catalytic agents for change in the society. Accordingly, the governor said, he continued to motivate all the five universities of the state, Indian Red Cross Society, Bharat Scouts & Guides, Rajya Sainik Board and North East Zone Cultural Centre of which he is the ex-officio head. He stressed that the universities and organisations have to outreach to strengthen the society with changed ‘silos’ (closed mindsets) and be the nodal agents to identify and motivate the beneficiaries of central and state government flagship programmes. Acharya stated he had called upon these organisations to adopt villages and constitute a team to visit the identified villages to interact with targeted beneficiaries of flagship welfare schemes/projects. He said as per the noble idea of Prime Minister Narendra Modi to identify and bring development equally in all the districts, Kiphire district has been selected as aspirational district among 115 backward districts in the country and that the programme was being implemented there. He said he requested the Prime Minister to include Mon district also as aspirational district.